Nigeria beat Niger 4-1 as Guinea equalised late to earn a 2-2 draw with Tunisia in the opening Group C games at the 2016 African Nations Championship. There was a hat-trick for Nigeria's Chisom Chikatara despite only coming on as a substitute in the 57th minute. While Alseny Camara scored with just eight minutes left on the clock to earn a point for Guinea. The next Group C matches in Rwanda are on Friday when Tunisia play Nigeria and Niger take on Guinea. Nigeria's coach Sunday Oliseh (pictured) was a frustrated man at the end of a scrappy and goalless first half against Niger. 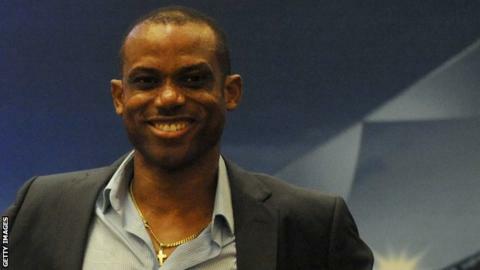 Oliseh's mood was lifted moments after the break when Moses Okoro scored after a good team move. Chikatara replaced Tunde Adeniji, who had helped in the build-up to the opening goal, with just over 30 minutes left to play. He scored the first of his three goals 15 minutes later when he fired home from a ball played over the top by Okoro. Niger got back into the game shortly after that when Adje Zakari Adebayor found the net with a long range effort. Their hope was short-lived though as Chikatara scored his second just a minute later, he then spurned chances for his hat-trick before eventually getting his third in injury time. Tunisia twice took the lead against Guinea through Etoile du Sahel's Ahmed Akaichim his opener was an acrobatic finish on 32 minutes, he then hit the bar shortly after. Alseny Camara tapped in to level on 39 minutes, but after the break Akaichi restored Tunisia's lead with a drive. Guinea escaped when Tunisia's Zied Boughattas headed against the bar and they completed a comeback when Camara hit his second from a corner. While the point will be celebrated by Guinea, they will be concerned that Camara was carried from the field with three minutes remaining and they will hope he is fit to continue in the tournament.